The Mojave Desert, the driest and smallest of the North American deserts, occupies only 7 percent of the total arid lands of North America, yet offers a wide diversity of habitats, from salt pans to mesa tops, high sand dunes to alkaline springs. It is home to over 2,500 species of plants and animals, more than 100 of which are considered to be in some degree of peril. 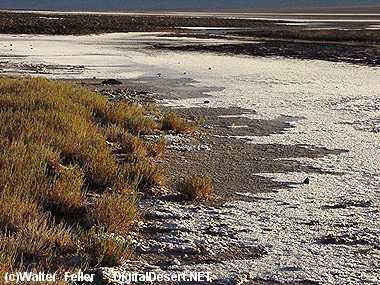 The Mojave receives an average of less than 15cm of precipitation per year, distributed unevenly. The California portion of the desert, for example, often receives as little as 3 cm of rain. In fact, the Mojave is considered a rain shadow desert because the mountains surrounding it block precipitation. The former community of Bagdad, California, once went an incredible 767 days without a drop of rain. Summers are long and hot in the Mojave; in fact, the highest temperature ever recorded in North America was 57ºC in 1913 at Death Valley. 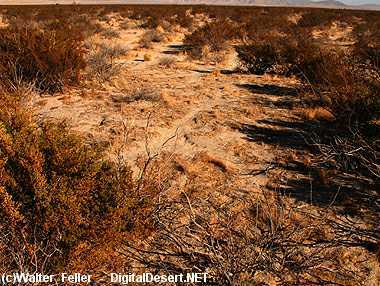 The Mojave Desert is dominated by low, widely spaced shrubs, including the creosote bush (Larrea tridentata) and Mojave sage (Salvia mohavensis). The Mojave flora includes few trees other than the signature Joshua tree (Yucca brevifolia), but features a number of cacti, several parasitic plants, and a vast variety of wildflowers. About 25 percent of the plant species in the Mojave are endemics--found nowhere else in the world. The spiny-armed Joshua tree lives only within the Mojave Desert; in fact, the boundaries of the species' range define the areal limits of the ecosystem. And some remnant environments within the Mojave host plant species that are found nowhere else within even this ecosystem. The Mojave's diversity of vegetation results from its extensive variety of rock types, wide range of elevations, and the existence of microclimates. Some of the higher mountain ranges, such as the Spring Mountains, even host coniferous forests. The fauna of the Mojave Desert is composed of both wide-ranging species, such as the desert bighorn sheep (Ovis canadensis) and jackrabbit, and highly specialized species that live only in small relict habitats, including the Inyo Mountain's slender salamander (Batrachoseps campi) and several species of pupfish (Cyprinodon sp.). Because of the harsh nature of the Mojave Desert ecosystem and the rarity of free water, riparian systems provide oases of species diversity not found elsewhere in the region. Important riparian systems within the Mojave include the Colorado, Mojave, and Amargosa Rivers. Desert springs also offer some of the Mojave's most unique riparian environments. Virtually all Mojave riparian systems are extremely deteriorated because of the introduction of exotic flora and fauna and the diversion of water resources by humans.